Over the course of his career, Rich Barsamian has forged an impressive list of accomplishments while working for some of the industry’s most recognized companies, including Grant, Edelbrock, GT Performance Products and Advanced Clutch Technology. Along the way, he has also served on SEMA select committees for the Young Executive Network (YEN), the Motorsports Parts Manufacturer Council (MPMC), the Hot Rod Industry Alliance (HRIA) and the SEMA Scholarship Committee. The wheel and tire market has improved over the past year, according to a widely held consensus among professionals in the automotive specialty-equipment industry. New offerings, technology and an improving economy bode well for sales in 2015, but there are also impediments that may deflate some of the optimism. Are You Using New SEMA Tools to Meet Vehicle Technology Challenges? Those who have attended the SEMA Show are likely aware of SEMA’s collaborative relationship with the Clemson University International Center for Automotive Research (CU-ICAR). SEMA’s partnership with CU-ICAR is now in its fifth year. It’s been a great partnership that yields useful tools to help SEMA members cope with vehicle technology and advance their products. Clemson has state-of-the-art equipment and top engineering talent to stay abreast of the newest automotive technologies. By connecting CU-ICAR and its graduate-level students and professors with the aftermarket, SEMA is shaping world-class research into practical tools for our member companies. One example is the just-released “Ride Guide,” a publication that puts more science into the matter of wheel/tire performance and selection. With support from SEMA and the Wheel & Tire Council (WTC), CU-ICAR recently conducted months of testing to determine the performance differences of varying wheel and tire combinations. One of the most common adages in the automotive specialty-equipment industry is that the quickest and easiest way to change the character of an automobile is to change its wheels. As anyone who toured the displays in the lower South Hall at the 2014 SEMA Show can attest, the variety available is stunning. From plated to painted and concave to split-spoked, the displays drew thousands of buyers from every type of reseller, and there were equally impressive new tools to provide mounting, handling and balancing options for installers. Few automotive specialty-equipment veterans doubt that the industry’s future rests in identifying potential young entrepreneurs and igniting in them the sort of passion and bold innovation that will create a fresh new generation of market leaders. The question is: how? Launching new ideas today is daunting even for large companies with plenty of resources, let alone for young, small-business-minded men and women. Held in conjunction with the recent 2014 SEMA Show, the annual Global Tire Expo (GTE)—Powered by the Tire Industry Association (TIA)—continued its reputation as a world-class “show within a show,” highlighting the tire niche’s tremendous significance within the automotive specialty-equipment marketplace. The Los Angeles Auto Show has developed a reputation as a “green” show that strongly focuses on alternative fuels and novel forms of propulsion. This may have been the case in prior years, but the 2014 Los Angeles Auto Show had more to offer enthusiasts than in recent years, as a burst of “track-ready” performance cars and creative variants on existing platforms came to light. That made it more like the SEMA Show—an optimistic environment in which OEM exhibitors launched fun-to-drive new models and showed off interesting concept cars that may very well enter production. Among them were several vehicles that could be of special relevance to SEMA members. The 2014 election was one that Republicans will look back upon fondly. The party picked up more than a dozen seats in the U.S. House of Representatives and nine in the U.S. Senate. As a result, the GOP has its largest majority in the House since 1931 and has regained control of the Senate after eight years in the minority. While November 4 was a night of celebration for Republicans, the real challenge will be governing in the weeks and months ahead. Washington’s dysfunction is both real and pervasive. The past two years have been the least productive in history. 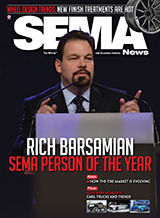 Breaking news from SEMA member companies, including Wes-Coast Marketing, Truck Accessories Group, Air Lift Co., VP Racing Fuels, Challenger Lifts and more. SEMA’s Automotive Restoration Market Organization and Hot Rod Industry Alliance have announced that the next Collector Car Appreciation Day will be celebrated on July 10, 2015. While untold numbers of businesses are saving money by moving to the cloud, IT experts say that these companies need to ensure that their cloud contracts include ironclad security protections or they’ll suffer an uncertain future. “Look at the news on any given day,” said Ron Zalkind, chief technology officer at CloudLock, a service provider that helps companies secure public cloud accounts, such as Google Apps and Sales Force. “You’ll clearly see that the number of risks and data breaches is accelerating.” Moreover, getting from “uncertainty” to “protected” can be more difficult than you might expect, given that many providers of cloud services are reluctant to put their security assurances in writing. For the first time in its long history, the 2014 SEMA Show ended with an “after party” called SEMA Ignited, where the general public viewed hundreds of cars and trucks from the trade-only event. Thousands of enthusiasts came out to get up close with one-of-a-kind cars, trucks and SUVs. Reporters flocked to SEMA Ignited as well to witness the thrill and excitement of this brand-new venue. Read on to see what reporters had to say about the first-ever SEMA Ignited. And tune in to the one-hour TV special scheduled to air on the Velocity Network in March 2015 to see footage of the event and the Battle of the Builders competition that culminated at SEMA Ignited.